Saturday, 8 April 2017. Capping a big day with three LCA events (International Festival, Volunteer Fair, and this play), students working with faculty advisor Elizabeth Brasher performed a 20-minute play, “Try, Try Again.” Student Arabella Camunez wrote the play, revising it heavily for this year’s performance. Students Erika, Nora, Arabella, and Natasha portrayed the Richdisaster family; students Arabella, Janaki, Samantha, Erika, and Dahlia played the Tryingharders; Nora, Thanya, Preston, Sasha, and Adaugo played the helpful mice; Elsa narrated; Isaac played the deadly snake; Kaleb played the villain, Mr. Grouchyface. Dahlia was stage manager and student director. Samantha and Erika worked the props. 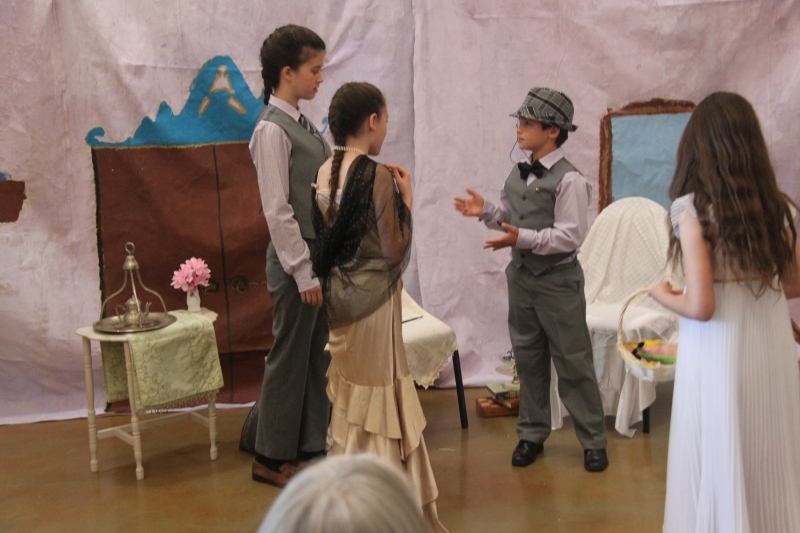 Costumes and set design, a lot of work, were in the hands of Samantha, Erika, Isaac, Natasha, Kaleb, Nora, and Dahlia. Parent Jessica Houston and teacher Arielle Lane were backstage help. The theater club thanks parents Aaron Brasher, Jessica and Kevin Houston, Mark Leisher, Natscha Preiss, and Jean-Pierre Reinhold for help and many others who donated and loaned materials, set pieces, and costumes. Following the play, 14 families joined in a delicious potluck dinner and camaraderie. Many helped clean up afterward so that the school was ready for classes on Monday. We have great, supportive families.